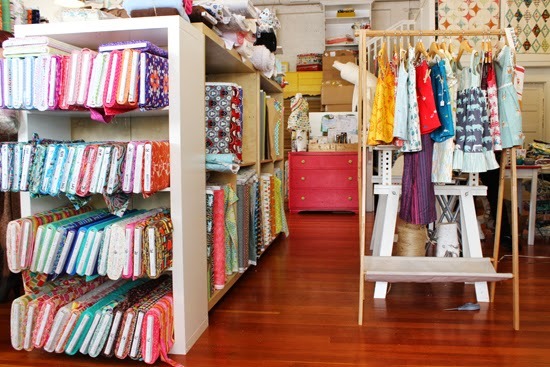 I've been to two awesome fabric stores that I would like to blog about, one in my hometown and one in Los Angeles. 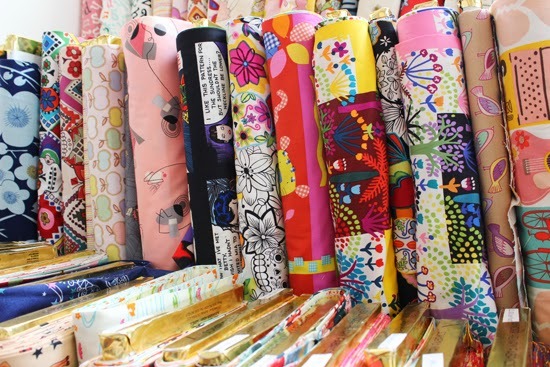 Today I'm going to talk about my visit to Birch Fabrics in Paso. 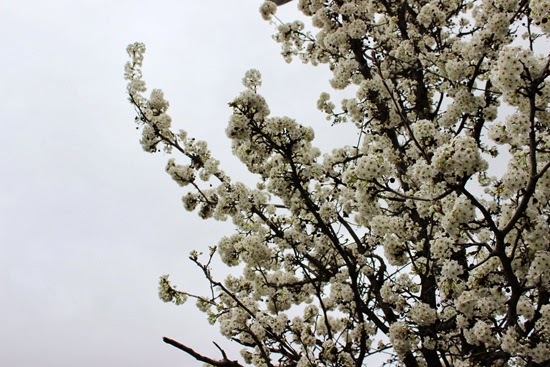 Where is Paso Robles? Paso is a cute little town halfway between San Francisco and Los Angeles. It's known for it's wine and boasts close to 200 different wineries. 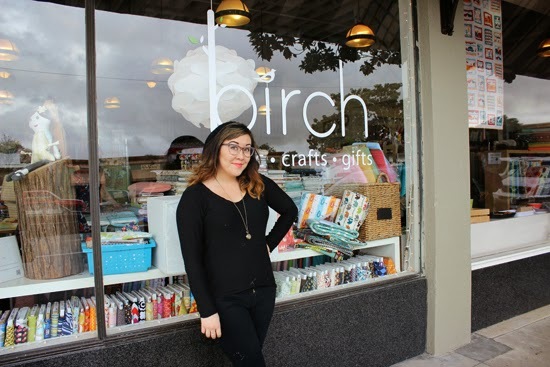 There are cute shops and amazing restaurants and, most importantly, it's the home of Birch! When Melissa informed me that Birch was having a sale I invited myself to tag along with her for the forty five minute car ride. FYI I have no shame and totally invite myself places, especially when fabric is involved! There were three girls working the sale. Unfortunately, the sidewalk sale landed on one of the few rainy days of the year and had to be moved inside. Despite that extra stress I thought the girls handled it well. It was pretty busy and they all provided great customer service. Melissa got some awesome stuff! You can't go wrong with Audrey Hepburn or Marilyn Monroe! 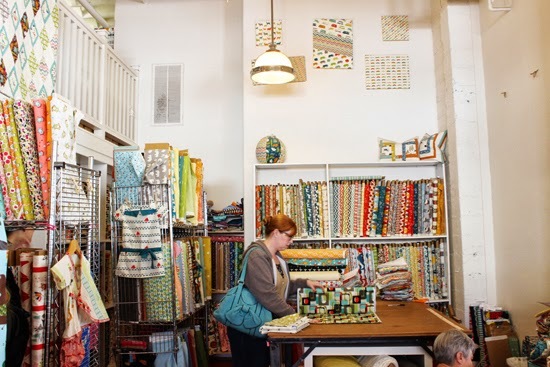 If you're not familiar with the store, they carry primarily quilting cottons and even design their own line of fabric. There were even some Colette and Sewaholic patterns! You know you have been partying too hard when you are covered in little bits of thread. I guess I shouldn't wear all black when I'm fabric shopping haha. We finished our fabric shopping extravaganza with lunch at my favorite restaurant in town, Odyssey. 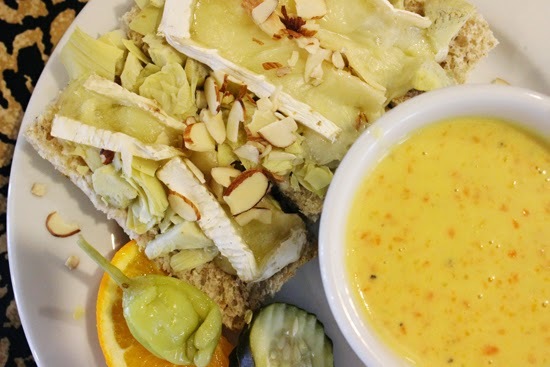 We both had the artichoke and brie sandwich (YUMMMMM) and I had a cup of carrot bisque. Fabric + good food = amazing day! Have any of you been to Birch? If I lived closer I would try and get a job there, I love it so much! What a fun shop! Going to have to check it out on my way up to SF sometime! I'm going to have to check that store out next time I'm down SLO way. Oooo! 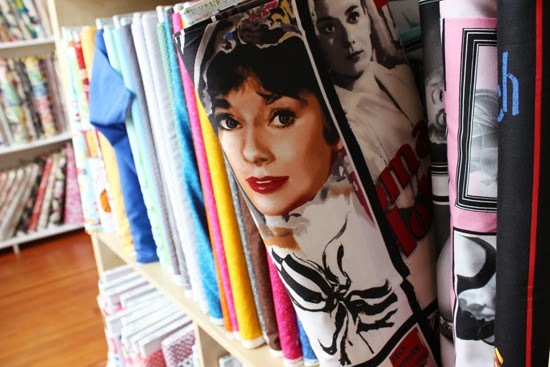 That Audrey fabric is fantastic! Birch looks like a really wonderful local shop. And, your lunch looks delish! How fun! 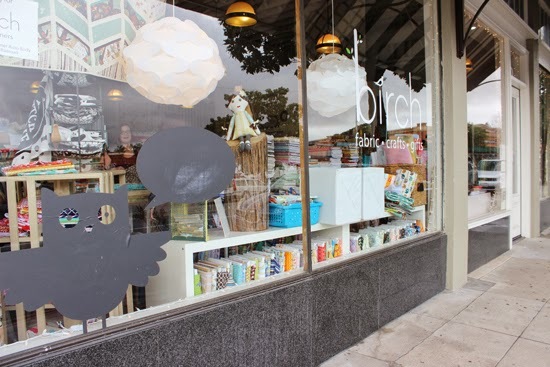 Philly used to have a bunch of cute stores like Birch, called Fabric Row, but it's dwindled in the past couple of years :) I wished you lived closer too! You seem like you'd fit right in. I have an LA blogger meetup in the works. I will keep you posted! I live 45 minutes away (bummer), but always stop in when I am in town. Yes, you have to! Whereabouts do you live? Oh cool, where are you from? Before you go to the Cotton Ball make sure you call and confirm their address. I think I heard somewhere that they might be moving. If you need any other recommendations let me know! I was raised in Paso and have spent a good amount of time there. Oh, that's awesome! I never make it your way, but I want to plan a trip for me and my husband sometime. What brings you to SLO? I grew up in Los Osos & graduated from Morro Bay High. Definitely! In fact, I think we are going on Memorial Day weekend so we can scout out wedding locations for my sister. So basically, you can recommend a ton of things: wedding venue, restaurant for the rehearsal dinner, hotels.... JUST KIDDING! this shop is so fun looking! i also loved that you just invited yourself along. looks like it was a very fun day.